Summer is winding down, the leaves are slowly starting to change colors, the days are getting shorter and the heat is giving way to cooler temperatures. It’s autumn! For beer enthusiasts, there’s nothing more satisfying than the anticipation of that smooth, fall blend and a little pumpkin spice. SpeedPro Imaging, the nation’s leader in large format imagery, is just as pumped as you are for a new season. The months of September and October are loaded with beer-centric festivals. There’s Octoberfest Zinzinnati in Cincinnati, Ohio, Fremont Octoberfest in Seattle, Washington and the Great American Beer Festival in Denver, Colorado, to name a few. As breweries become more of a familiar fixture across America, brewers need to start formulating a plan to stand out from the crowd. As we noted, it’s a competitive landscape. Just calling yourself a brewery isn’t going to cut it anymore. You need to show why patrons should give your establishment a visit. At SpeedPro Imaging, we partner with breweries who want to be seen. You’ve got the right formula to make an outstanding product. Now is the perfect time to team up with SpeedPro Imaging to land the patrons who will keep the beer – and cash revenue – flowing. Just like your beer offerings, our Big. Bold. Solutions are never ending. Let’s examine five specific products and services SpeedPro Imaging offers to take your brewery to the next level. Window Graphics: Crisp. Refreshing. Bold. That describes the graphics your local SpeedPro Imaging studio owner will design for your windows. We transform the ordinary windows into visual artwork that aligns with your brand. We offer both short-term and permanent impact graphics. Flags & Outdoor Signage: Custom flags are sure to add flair standing tall outside your establishment. Our flags and outdoor signage are highly customizable and an effective advertising medium. We can help convey your message outside to draw customers inside. Wall Murals: Let your walls entertain customers with coverings and murals. Brick, concrete, wood or your average sheetrock – no matter the service, we know how to add vivid colors and colorful display graphics. Leave your guests visually hypnotized as your beers captivate their taste buds. Table Graphics: Often overlooked, but an essential player in your marketing game plan. This is where your patrons spend the most time. Reinforce everything that is special about your brewery with mesmerizing table coverings. Give notice to upcoming events, or show them how to engage with you via social media. Decals: Small in name, big in stature. We’re not talking those little, annoying stickers you used on models. 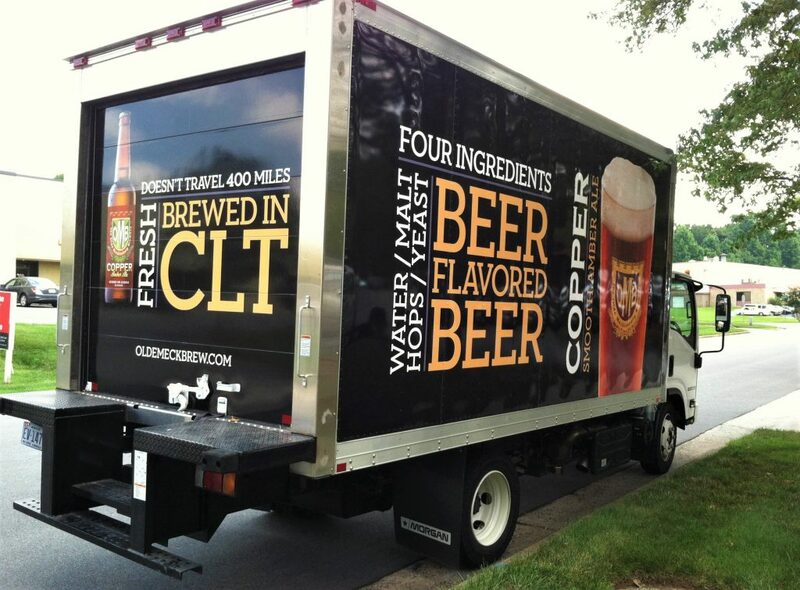 No matter the size, these bold, multi-dimensional graphics are durable and a cost-effective form of advertisement. That’s just a sample of the exciting solutions we offer breweries and other companies. You can find the full menu when you visit speedpro.com, send us an email or call us at (844) 274-4784. Let’s kick off the autumn season the right way: with a nice cold brew, and buckets of profits!